Global atmospheric water generator (AWG) market size is predicted to exceed USD 8.5 billion by 2024 as a result of its applications in commercial, residential, and industrial sectors. Scarcity of fresh water due to exhaustion of water resources like drying of lakes & rivers as a result of less rainfall & high temperatures is predicted to boost the demand for atmospheric water generators. 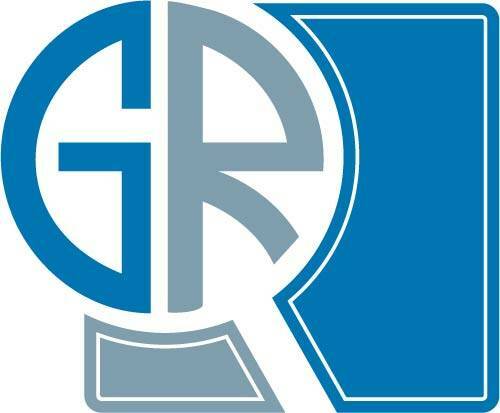 Rising investments in infrastructure expansion & industrial growth are projected to increase the fresh water requirements for industrial & residential applications and this will boost the AWG industry growth trends over the next eight years. As per the WHO reports, over half of the world population suffers from waterborne ailments and AWG systems are the best alternative which can fulfill the clean & fresh drinking water requirement of the people across the globe. 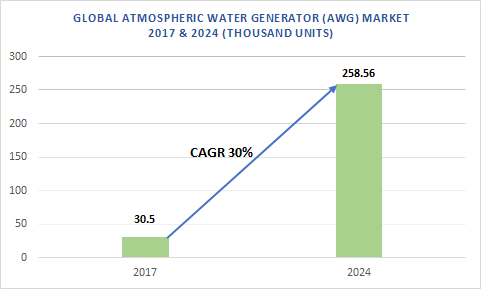 Atmospheric water generator (AWG) industry size evaluated at over 30.5 thousand units in 2017, is expected to reach 258.56 thousand units by 2024, growing at a CAGR of around 30% over the period of 2018-2024. Lack of availability of fresh water along with infrastructure growth is predicted to increase the need for freshwater for industrial and residential uses. This, in turn, is predicted to boost the demand for atmospheric water generators in coming years. Furthermore, government initiatives at a global level such as Japan’s DWQS (Drinking Water Quality Standard), Safe Drinking Water Act in U.S., National Rural Drinking Water Program in India, and European Union’s drinking water directive are predicted to fuel the market growth by ensuring availability of pure drinking water. Atmospheric water generator (AWG) market is segmented in terms of products, applications, and regions. Wet desiccation AWG market estimated at 600 units in 2017, is predicted to grow substantially at a rate of around 34.5% over the period of 2018-2024 owing to technological innovation resulting in growing demand. Residential segment led the application landscape in 2017 by contributing about 55% to the overall volume and is predicted to witness a noticeable growth over the forecast timeline due to growing customer awareness about the technological benefits of using AWG systems in residential applications. MEA AWG market, contributing about 27% of the overall demand in 2017, is predicted to witness a substantial growth over the period of 2016-2024 owing to the scarcity of fresh water reservoirs along with high costs of investments in setting up of desalination units. Asia Pacific Market, dominating the regional segment by contributing USD 400 million in 2014, is anticipated to witness a noticeable growth over the forecast timeline owing to growing investments in infrastructure activities, presence of leading component producers, low costs of production, and availability of cheap labor. India, Thailand, China, and Indonesia are predicted to contribute majorly towards the regional growth.